Ariella determines to triumph in the arena, knowing her life will be forfeit should anyone uncover the truth. Wow! This was the first book that I have read by Tracy Higley and I'm looking forward to reading more by her. City on Fire takes you all the way back to the time when Jerusalem fell to Rome and the people inside were either slaughtered or taken into captivity. Ariella, is one of the few left alive, after everyone, but her brother is slaughtered. She is shipped off to Rome and for the next 9 years, she is forced to work in the home of a greedy and disgusting individual, who thrives on the most heinous acts. However, Ariella finds her means of escape with a gladiator troupe and is able to flee Rome, to Pompeii. Quintus Cato has suffered personal loss in Rome and has decided to leave that life behind and head to Pompeii with his mother and littler sister. Not long after arriving, Cato is introduced to Maius, a leader of Pompeii. It isn't long after that through Maius, Cato sees the corporation he viewed in Rome hasn't left him. Wanting to help the city to get out from under Maius thumb, Cato takes up a personal campaign that leads him to meet and interesting young gladiator named Ari. The paths that Ariella and Cato face are different, but at the same time, similar. Cato wants a quiet life. Ariella just wants to be free again. To find the right way, they both end up using their smarts and their brawn, and in the end, they are both led to a home, full of caring and compassionate people. The home is full of people that the Emperor of Rome wants to see killed, Christians. Ariella and Cato grow through out this whole story. Cato, not wanting to get back into the political world, only to see that is where is needed to help those he cares about. Ariella after her years of abuse, fights to trust and depend on people. 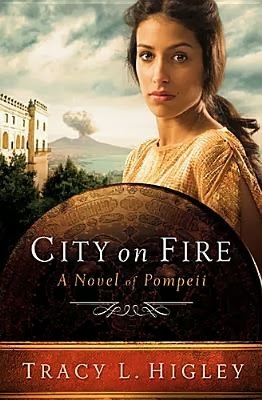 City on Fires brings you into the everyday world of Pompeii and just as you are settled in, the story begins to build, like that of a mountain, slowly giving away signs that chaos and destruction is on the way. As the book takes you along, the more you need to know and find out. Tracy L. Higley started her first novel at the age of eight and has been hooked on writing ever since. She has authored nine novels, including So Shines the Night, Garden of Madness, and Isle of Shadows. Tracy is currently pursuing a graduate degree in Ancient History and has traveled through Greece, Turkey, Egypt, Israel, Jordan, and Italy, researching her novels and falling into adventures. See her travel journals and more at TracyHigley.com. Thank you to Booksneeze and Thomas Nelson, I received a copy of this book for free in exchange for an honest review. I've read a couple of her books and really enjoy them! I saw she recently re-released this one, so looks like I need to add it to the list :) thanks for the review! Jamie, I need to read more of her books, this was my first one by her. I'm excited to see what other stories are out there.